This was a fun project I just completed. They're couple of mock comic book covers I did for the guys at http://countryslickers.com. Stop by there and watch their short film featuring these characters. Good stuff. 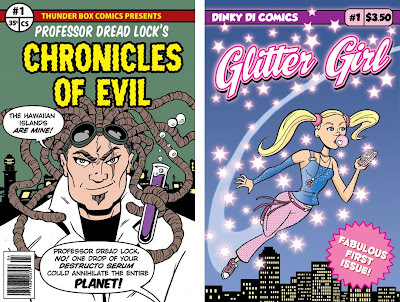 The Professor Dread Lock one is supposed to be more of an 80s era comic, hence the flat color, and the Glitter Girl is more modern. Also posted is an animated gif showing the progression of the Dread Lock cover. Love the Glitter Girl -- that's classic Slayton simplicity. Love it! Glitter Girl seems to be a favorite. Can't wait to work with you on a bigger project!